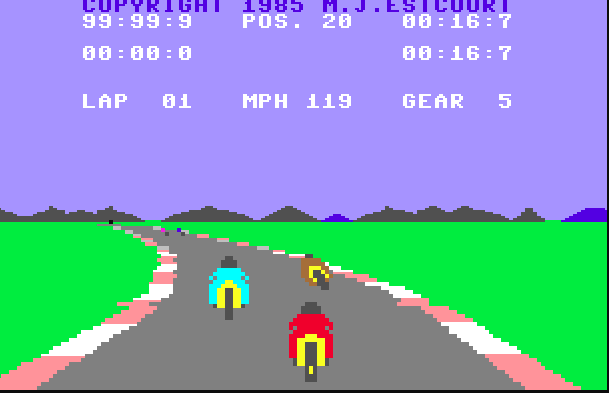 This was a little-known ‘sim’ motorbike racing game that a friend of mine lent me. It was published by the mostly simulation publisher Digital Integration. It was also the first game I’d ever seen that offered a ‘preview’ of each course. The premise here was that you could try and memorise the layout of each one the more times you watched it. In this preview, nothing else was drawn onscreen other than the track. It was incredibly slick and quick to watch. The second was that it featured a little yellow mark on the back tyre of your bike to help give the illusion of the tyre rotating with speed. I think having a smooth framerate and a sense of speed was quite rare in these early home micro racing titles. I played it for a long time, and can still remember the “Swedish” track in my mind quite well to this day! Whilst you’re here, if you haven’t already please consider signing up to our Dangerous Driving Club. See you next week for Part 7.